Today I am officially in the later stages of this pregnancy. I know this not because of any dates I may have passed, or circumference reached, but purely and simply because this morning, voluntarily and without duress, I seized bin bag and hoover, and cleaned out my car. It’s true, I’m nesting (or just possibly starting to realise that my inlaws/father may need to use my car to ferry Kitty around at some stage in the not too distant future and therefore it might be an idea if it was actually habitable by more than just her highness and myself). But fear not that I’ve turned into some sort of domestic goddess; the urge to clean, tidy, organise and declutter is being happily balanced by the pull of yarn, needles and fabric. 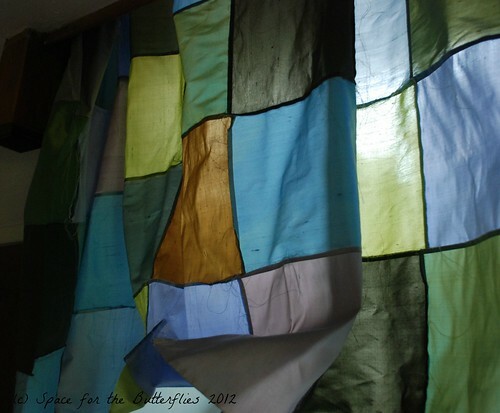 And oh, what fabric I’ve been playing with. Technically, this counts as sorting and organising. Technically. I started a silk quilt way back when (that would be March), and after I’d sewn a couple of rows together, life, the universe, and a really big stack of magazines that needed tidying got in the way of my sewing machine and my little squares of Monet flavoured prettiness sat forlornly on top of the bookcase waiting for the moment when I would rediscover the desk again. Now as those of you who’ve ever sewn with silk are well aware, it frays if you breath on it, it frays if it thinks you looked at it funny, in short it frays as if its mere existence were an affront to the natural order of things. Hence, as I said, the sorting and organising. 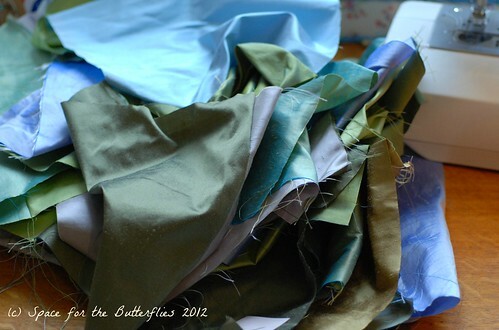 It’s much more organised to sew squares of silk into a finished quilt top before folding it up and moving it around, than moving a little stack of loose pieces all pinned together in row numbers. At least, that’s my story and I’m sticking to it. 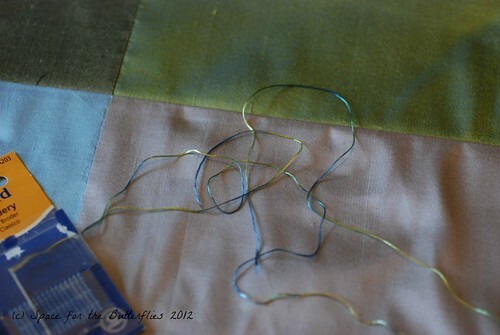 And of course, what’s not to like in playing with gorgeous colours of scrunchy silk. As a quilt top it came together pretty quickly once I got started. I daren’t take it outside for photos in the weather we’ve been having recently; even on the sunniest days a freak raincloud would be sure to come up out of nowhere and soak it, but the banisters are just about big enough to give you an impressionist’s idea. If the wiggle bump holds fire for long enough (and that nesting bug doesn’t kick in too hard) I’m going to try get the wadding and backing and make up the quilt sandwich before Baby-Day. In a moment of hormone induced craziness I’ve decided to hand quilt it so if it’s all made up then a little simple running stitch while the baby sleeps/is cuddled by adoring friends and family sounds eminently doable (mothers of many, don’t disillusion this poor girl just yet!). a green/blue variegated faux silk that I bought years ago at a Knitting and Stitching show, inspired I think by taking a Royal School of Needlecraft taster class in which we embroidered a pansy, very slowly. Given the quilt, it’s an excellent thing that my pansy embroidering never really took off. The plan is to quilt about a quarter-inch from the seams, but I’ve no idea how much thread I’ve got left so I’ll start in the middle and see where we go from there. 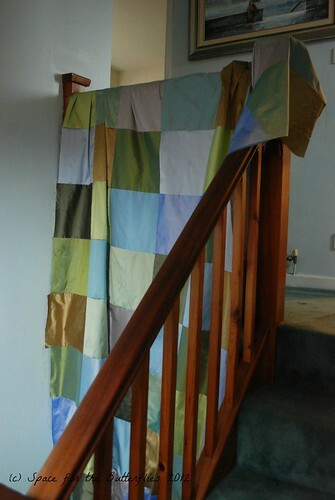 Or of course, I could just keep it as a curtain.